It can replace Hohner 260. 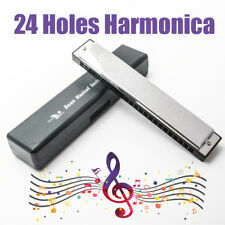 Specifications: 10 holes Material: iron Package included: 1pcs 10 Hole Harmonica Neck Rack. When playing KAZOO, take the large side in the mouth, with your voice to play the tunes, vocal vibrations can drive KAZOO vibrate. Just a minute you play the tone of your dreams with KAZOO. 1 X KAZOO. Hot Folding Fork Spoon Knife Stainless Steel for Camping Hiking Picnic Flatware. Parrot Bird Solar Power LED Light Garden Fence Walkway Lamp Outdoor Decoration. Waterproof Swim Buoy Floating 20L Dry Bag Inflatable Air Storage Bag Snorkeling. Until now, harmonicas just weren't made for blues. For one thing, they didn't last. After two or three blues sessions it was tough even for a musician like Mel to get a good sound. The punishment of blues wailing often caused the reeds to lose pitch and flat out. Now you've got the blues harp. With a new kind of reed system. And you can get a great blues sound with a minimum of effort. Mel said the Blues Harp was the best harmonica he'd ever played. See if you don't agree. The punishment of blues wailing often caused the reeds to lose pitch and flat out. Now you've got the blues harp. Designed primarily to make playing and note bending easy for entry level players, the Blues Bender P.A.C. allows everybody access to the bluesy notes needed to make any riff complete. The special patented cover increases the volume of air enclosed between the reeds and cover-plates which, when thrown into vibration and vented through the special side vents, allows for greater volume and projection. Features thicker than normal reed plates for a consistent tone. Extremely airtight between the mouthpiece and the reed plates, allowing for easier note bending and making expressive playing easier. The wide open coverplate design with side vents give the Rocket the punchy loud sound that professional harmonica players crave. The one, the only, the original -- the harp that was there when harmonica blues was born. Made famous when played by every serious harmonica player from Little Walter to John Lennon, Paul Butterfield to Bruce Springsteen, Neil Young and many, many more. The result of over 100 years of tradition and German craftsmanship, it is still the number one choice of top professionals and the most recognizable model all over the world, known for its full tone and wood comb. Play the Marine Band and be a part of history. Wooden harmonica designed for children. Beautiful and colorful patterns printed on the plastic harmonica. Great music educational toy for children. Awesome response, superior bendability and the sweetest tone ever. This harp is the first choice for those learning to play. 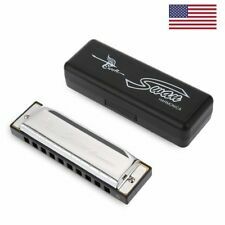 Its special airtight design makes it the most recommended go-to harp for harmonica players of any style, including blues, country, folk or rock. The plastic comb doesn't absorb moisture making it longer lasting. Harp of choice of harmonica virtuoso John Popper (of Blues Traveler) and played by Bob Dylan on his 2007/08 tour. Chances are your favorite player has several of these harps in his case. Country, folk or rock. Plastic comb produces a bright, clear tone; Recessed reed plates for air tightness; Screw assembly for easy maintenance; Harmonicas in the keys of A, Bb, C, D, E, F and G; Includes a deluxe, black pro type hard shell case; Presented in a FREE deluxe carrying case. 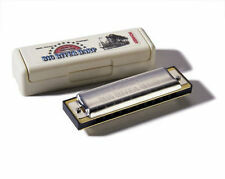 The Bluesband Harmonicas are economical 10 hole harmonicas for all ages. They have a plastic comb and are designed for beginner level players in the rhythm and blues style. The Old Standby, One of the best beginner Diatonic Harps. Piedmont Blues or East Coast Blues was born in the American Southeast during the 1900s. Out of its diverse influences arose some of Americas most well known blues harmonica players. The Piedmont Blues set presents the beginning harmonica player with an affordable way to sample playing in seven different keys (G, A, Bb, C, D, E, F). 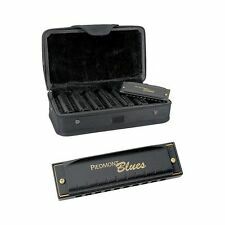 Each harmonica has a matte black finish with gold trim and the entire set comes in a zippered case. Packaging includes a cardboard sleeve with printed instructions and a key chart to get you started. 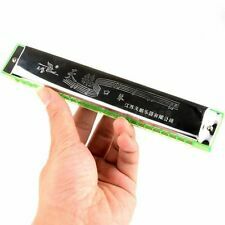 New Two Rows 16 Holes Harmonica Children Kids Musical Instrument Education Detail Material : Metal Size : 13*2.8*2.2cm Style : Metal Painted Harmonica Kids Educational Music Toy 100% brand new and high quality Color: Pink Train baby's interest in music, to develop the child's potential art cells, the bright colors can produce greater appeal, let the baby to the color for more understanding Package includes: 1pc X Harmonica Note: Light shooting and different displays may cause the color of the item in the picture a little different from the real thing. The Folkmaster harmonica includes a hardshell carrying case. Molded plastic waterproof body. Hardshell carrying case. A diatonic harmonica with 10 holes and 20 notes all in a coverplate of vivid green. In the past, all harmonicas had wood combs. First pioneered on the popular Manji diatonic, this comb has been widely praised by players. This harp is the first choice for those learning to play. Harp of choice of harmonica virtuoso John Popper (of Blues Traveler) and played by Bob Dylan on his 2007/08 tour. Country, folk or rock. The ingenious finding of the 'Diatonic Harmonica' is the work of this man. Diatonic harp with plastic comb and stainless steel covers - available in many keys from LD to HA and many special tunings; Extremely airtight smooth-edged plastic comb with ergonomic stainless steel cover plates; Brass reedplates, 1.0 mm thick, screwed; Leather pocket included; If you start as a beginner, then you should be aware, that this is the mother of all tunings, the so called 'Richter-Tuning'. The ingenious finding of the 'Diatonic Harmonica' is the work of this man. Richter is said to be descent from the Bohemian area east of Klingenthal from a town called 'Haida'. It's not really proven, however it's fact, that the 'Richter Harmonica' is only called 'Haidaer' by Seydel employes since the beginning of the production more than hundred years ago. New Quality (Harp) HARMONICA HOLDER for 10 Holes, with FREE BONUS! DELUXE HARMONICA HOLDER. FOR 10 HOLE HARMONICA. Spring Loaded holder designed for fast harmonica changes. Padding to protect your harmonica from marks or residues. Harmonica holder will adjust to your perfect comfort angle. 3 out of 5 stars - New Quality (Harp) HARMONICA HOLDER for 10 Holes, with FREE BONUS! 1 product rating1 product ratings - New Quality (Harp) HARMONICA HOLDER for 10 Holes, with FREE BONUS!